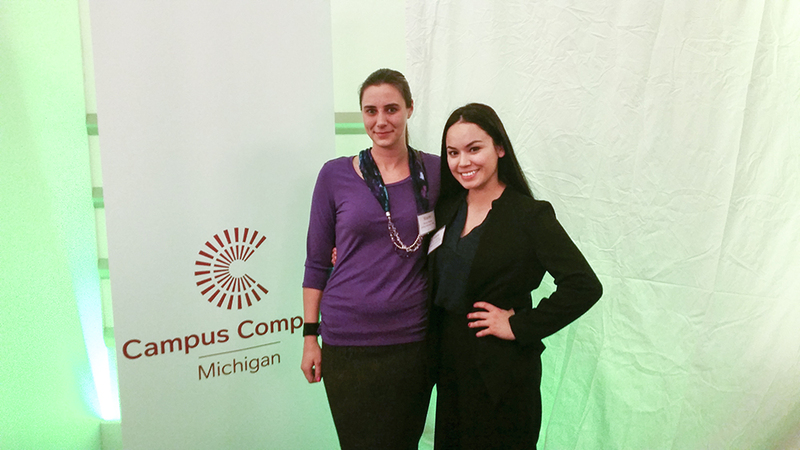 Two Kellogg Community College students were honored with Michigan Campus Compact (MiCC) Commitment to Service awards last month for their dedication and commitment to community service while students at KCC. The students, who received the awards for community projects completed during their service-learning coursework at KCC during the Spring 2016 semester, were honored at the MiCC Awards Gala April 7 at the Kellogg Hotel and Conference Center in East Lansing. KCC students Stacey Hapner, of Quincy, and Maria Hurtado, of Battle Creek, were among just 43 students statewide to receive the 2016 Commitment to Service Award. The award recognizes up to two students per member campus in the state of Michigan for either the breadth or depth of their community involvement or service experiences. Hapner was nominated by instructor Ann Lown for completing a service-learning project that involved the creation of an informational binder including all the information a veteran would need to enroll in college at KCC. Multiple binders now exist at KCC’s Grahl Center in Coldwater and at local veterans administration offices for use by prospective students. Hapner is a veteran of the U.S. Navy, serving four years as a Seabee including a six-month tour in Afghanistan. In 2015, she became the first woman ever appointed to serve on the Branch County Veterans Affairs Board. Hurtado was nominated by Dental Hygiene Program Director Bridget Korpela for going “above and beyond” in two service-learning courses. Hurtado served at Marian E. Burch Adult Day Care Center by assisting with breakfast preparations, bingo and communication for clients who preferred speaking with a Spanish-speaking volunteer. She also helped organize and implement a project that brought a representative from Proctor & Gamble to the center to donate time and power brushes to clients, showing them one-on-one how to use the appliances. Hurtado also assisted with redesigning, painting and decorating a room for woman at the local SAFE Place Shelter. “Maria is not only an outstanding student in the classroom, but she is an amazing leader at KCC and in our community,” Korpela wrote in her nomination. For more information, contact the KCC’s Service-Learning office at servicelearning@kellogg.edu. For more information about service-learning at KCC, visit www.kellogg.edu/service-learning. Michigan Campus Compact is a coalition of college and university presidents who are committed to fulfilling the public purpose of higher education. MiCC promotes the education and commitment of Michigan college students to be civically engaged citizens, through creating and expanding academic, co-curricular and campus-wide opportunities for community service, service-learning and civic engagement. For more information about the organization, visit www.micampuscompact.org or contact MiCC Executive Director Robin Lynn Grinnell at 517-492-2428 or rgrinnell@micampuscompact.org. Michigan Campus Compact is affiliated with Campus Compact, www.compact.org, and theMichigan Nonprofit Association, www.mnaonline.org. Pictured above in a photo by KCC Service-Learning Manager Kate DeGraaf are Hapner, left, and Hurtado at the MiCC Awards Gala April 7 at the Kellogg Hotel and Conference Center in East Lansing.